The Sociological Cinema is created and edited by Lester Andrist, Valerie Chepp, and Paul Dean. Launched in 2010, TSC is a resource for using video and pop culture to teach and learn sociology. We started as a database of annotated video clips, and have since expanded into other forms of media to engage students in teaching and learning. Readers can now browse our blog for essays and podcasts about pedagogy, media, and pop culture; find images on Pinterest for presentations or learning about sociological topics; engage in conversations on Twitter, Facebook, and Tumblr; and explore curated content on our modules page. In the spirit of public sociology, we hope these resources help to bring the sociological perspective to a broad audiences and to further causes for social justice. Elijah Watson interviewed us for Complex in order to get a sociological perspective on the new film The Purge: Anarchy. Author Brian A. Rellinger discussed The Sociological Cinema in Educause Review as an example of how online technologies can enhance the liberal arts learning experience. 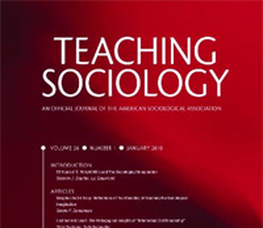 Nathan Palmer & April M. Shueths wrote an article that mentions The Sociological Cinema as an open educational resource that brings educators together into a teaching community. Manjusha Madhu wrote an article about The Sociological Cinema for the India based newspaper The Sunday Guardian. Authors Chris Caldeira & Joan Ferrante wrote a web review of The Sociological Cinema in Teaching Sociology (vol 40, p.191). MERLOT awarded The Sociological Cinema their 2012 Classics Award for Sociology. The editorial board acknowledged us for making an "exceptionally valuable contribution...to advancing teaching and learning within the discipline." In December we had the honor of being Norton Sociology's featured sociologists of the month!